St. Innocent of Alaska, depicted holding his book "The Indication of the Way Into the Kingdom of Heaven", which he wrote in Aleut, but which became a popular text in Russian as well. 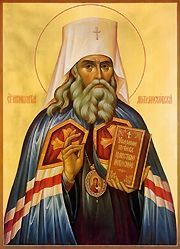 Our father among the saints Innocent of Alaska, Equal-to-the-Apostles and Enlightener of North America (1797-1879), was a Russian Orthodox priest, bishop, archbishop, and Metropolitan of Moscow and all Russia. He is known for his missionary work, scholarship, and leadership in Alaska and the Russian Far East during the 1800s. He is known for his great zeal for his work as well as his great abilities as a scholar, linguist, and administrator. He was a missionary, later a bishop and archbishop in Alaska and the Russian Far East. He learned several native languages and was the author of many of the earliest scholarly works about the natives and their languages, as well as dictionaries and religious works in these languages. He also translated parts of the Bible into several native languages. St. Innocent, né Ivan (John) Evseyevich Popov-Veniaminov, was born on August 26, 1797, into the family of a church server in the village of Anginskoye, Verkholensk District, Irkutsk province, in Russia. His father died when John was six. In 1807, John entered the Irkutsk Theological Seminary. In 1817 he married, and on May 18, 1817 he was ordained deacon of the Church of the Annunciation in Irkutsk. He completed his studies in 1818. He was appointed a teacher in a parish school, and on May 18, 1821 he was ordained priest to serve in the Church of the Annunciation. At the beginning of 1823, Bishop Michael of Irkutsk received instructions to send a priest to the island of Unalaska in the Aleutian Islands of Alaska. Father John Veniaminov volunteered to go, and on May 7, 1823, he departed from Irkutsk, accompanied by his aging mother, his wife, his infant son Innocent, and his brother Stefan. After a difficult one-year journey, they arrived at Unalaska on July 29, 1824. After John and his family built and moved into an earthen hut, he undertook the construction of Holy Ascension Church on the island and set about studying the local languages and dialects. He trained some of his parishioners in construction techniques and with them undertook the construction of a church, which was finished the following July. Father John's parish included the island of Unalaska and the neighboring Fox Islands and Pribilof Islands, whose inhabitants had been converted to Christianity before his arrival, but retained many of their pagan ways and customs. Father John often traveled between the islands in a canoe, battling the stormy Gulf of Alaska. His travels over the islands greatly enhanced Father John Veniaminov's familiarity with the local dialects. In a short time he mastered six of the dialects. He devised an alphabet of Cyrillic letters for the most widespread dialect, the Unagan dialect of Aleut and, in 1828, translated the Holy Gospel of St. Matthew and other church materials into that dialect, which were eventually published in 1840 with the blessing of the Holy Synod of the Russian Orthodox Church. In 1829, he journeyed to the Bering Sea coast of the Alaskan mainland and preached to the people there. In 1836, his travels even extended to the south, to the Ross Colony north of San Francisco and to the Spanish missions of northern California. At Ross Colony he conducted services at its small, wooden chapel. In 1834, Father John was transferred to Sitka Island, to the town of Novoarkhangelsk, later called Sitka. He devoted himself the Tlingit people and studied their language and customs. His studies there produced the scholarly works Notes on the Kolushchan and Kodiak Tongues and Other Dialects of the Russo-American Territories, with a Russian-Kolushchan Glossary. Innokentii (Innocent), Metropolitan of Moscow (1797-1879), called the "Apostle of Alaska"
In 1838, Father John journeyed to St. Petersburg and Moscow, Russia, and Kiev, Ukraine, to report on his activities and request an expansion of the Church's activities in Russian America. While he was there, he received notice that his wife had died. He requested permission to return to Sitka. Instead, it was suggested that he take vows as a monk. Father John at first ignored these suggestions, but, on November 29, 1840, made his vows. He chose the name Innocent in honor of Bishop Innocent of Irkutsk. On December 15, 1840, Archimandrite Innocent Veniaminov was consecrated Bishop of Kamchatka and Kuril Islands in Russia and the Aleutian Islands in Russian America. His see was located in Novoarkhangelsk, which he returned to in September 1841. He spent the next nine years in the administration of his see as well as on several long missionary journeys to its remote areas. On April 21, 1850, Bishop lnnocent was elevated to Archbishop. In 1852, the Yakut area was admitted to the Kamchatka Diocese, and in September 1853, Archbishop Innocent took up permanent residence in the town of Yakutsk. Innocent took frequent trips throughout his enlarged diocese. He devoted much energy to the translation of the scriptures and service books into the Yakut (Sakha) language. In April 1865, Archbishop Innocent was appointed a member of the Holy Governing Synod of the Church. 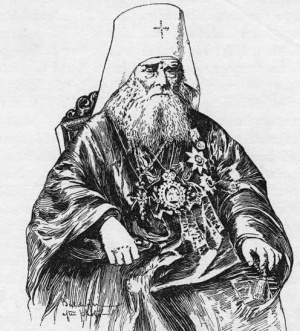 On November 19, 1867, he was appointed the Metropolitan of Moscow, replacing his friend and mentor, Filaret, who had died. While there, he undertook revisions of many Church texts that contained errors, raised funds to improve the living conditions of priests and established a retirement home for priests. Innocent died on March 31, 1879. He was buried on April 5, 1879, at Troitse-Sergiyeva Lavra. On October 6, 1977, the Church of Russia, acting on the official request of the Orthodox Church in America, proclaimed Innocent a saint. His feast day is celebrated twice a year -- on October 6 and March 31. In 1994, during excavations on the grounds near the Holy Ghost Church at the Troitse-Sergiyeva Lavra, St. Innocent's relics were discovered and are now venerated by the faithful both in Russia and America. Bringing many peoples to the knowledge of truth. Now by your prayers help lead us into the Kingdom of Heaven. Proclaiming the Gospel of Christ to the natives in their own tongues. Pray to Him for the salvation of our souls in His Heavenly Kingdom! Is your life, O holy father Innocent, Apostle to our land. And God delivered and preserved you unharmed. That the Lord truly guides a man in the way he should go. Proclaims the dispensation and grace of God! You were kept unharmed and exalted in humility. Pray that He may guide our steps in the way we should go. This page was last edited on June 30, 2016, at 15:47. This page has been accessed 77,924 times.